G-Protein coupled receptors (GPCRs) are of particular interest as pharmaceutical target proteins in Medicinal Chemistry since a large number of diseases can be treated by selective GPCR agonists or antagonists. 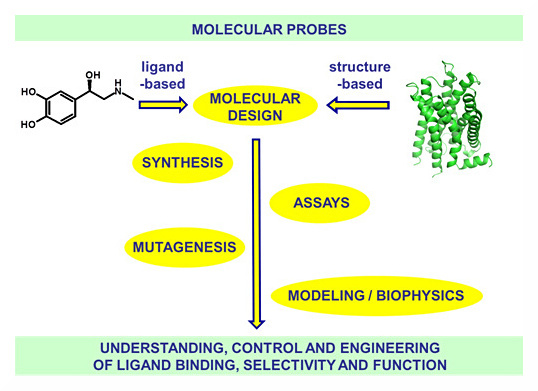 Peter Gmeiner’s group investigates design, chemical synthesis and pharmacological properties of subtype-selective GPCR ligands. Using an integrative approach, we develop molecular probes to understand, control and engineer receptor-ligand binding, selectivity and function. Although G-protein coupled receptors (GPCRs) have been studied extensively in the past, our understanding of their function at the molecular level is still incomplete. It has been shown that GPCRs mediate diverse signal-transduction pathways by similar mechanisms by binding a variety of ligands and G-proteins. Their interaction with agonists leads to a low-affinity conformation of the active state that is thought to facilitate G-protein binding. Only in the presence of both agonist and G-protein is the high-affinity receptor state formed, which promotes signal transduction. The β2-adrenergic receptor (β2AR), which represents an important target for cardiac and asthma drugs, is an extensively studied model system for the large superfamily of G-protein coupled receptors (GPCRs). In 2007, the receptor was crystallized in its inactive conformation bound to the partial inverse agonist carazolol. To overcome relatively rapid association and dissociation rates of commercial β2AR agonists, our strategy depended on a combination on a covalent β2AR agonist incorporating a β2-adrenergic agonist core and a reactive chemical group that could be targeted to a specific residue on the receptor. Employing the structure of the carazolol-bound β2AR as a template, a flexible linker was added to bridge these two components. Thus, the covalent attachment would not inhibit binding of the agonist core or conformational flexibility of the transmembrane helices. The covalent β2AR-agonist complex formed efficiently, and was able to activate a heterotrimeric G protein. A covalent agonist-bound β2AR–T4L fusion protein could be crystallized and determined for its structure at 3.5A˚ resolution. The Gmeiner Laboratory investigates also the dopamine receptor subtypes D2long, D2short, D3 and D4 as valuable target systems. 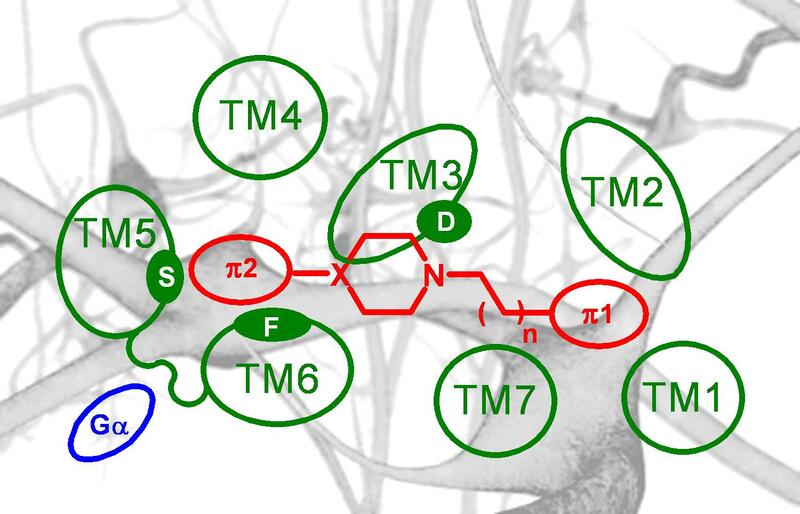 On the course of these investigations, we found the first family of receptor ligands that selectively display full (neutral) antagonist properties at the dopamine D4 receptor. Thus, behavioral pharmacological investigations at the ETH Zuerich indicated atypical antipsychotic activities for the azaindole derivative FAUC 213. In collaboration with research laboratories at the University of North Texas and Cornell University, molecular origins for the high subtype selectivity have been detected. Heterocyclic carboxamides of the type FAUC 346 and FAUC 365 as analogs of the lead compound BP 897 were developed in the Gmeiner Laboratory as valuable compounds for the treatment of cocaine abuse. In vivo investigations that were performed at the National Institute of Drug Abuse (NIDA) in Bethesda, USA, revealed diagnostic biological properties in animal models. Our drug candidates with benzothiophene and azaindole partial structure display excellent dopamine D3 receptor affinity and selectivity in combination with a partial agonist component. Further investigations have been pursued in collaboration with an international pharmaceutical company. 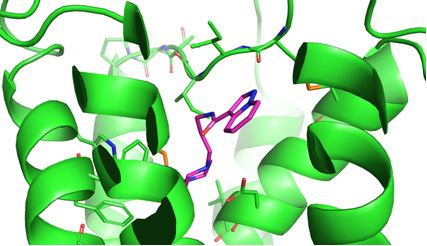 When we explored the binding site crevice of the dopamine receptor, novel atypical arene bioisosteres could be identified, which had not been investigated in drug discovery, yet. Thus, bi-layered arene bioisosteres of the metallocene and paracyclophane type showed ligand binding properties that substantially succeeded those of mono-layered benzene analogs. This clearly indicates substantial plasticity of the binding pocket. Our current investigations involve site-directed mutagenesis studies and homology modeling, to gain further insights into the mechanisms of recognition. As further arene bioisosteric moieties, the Gmeiner group identified non-aromatic enyne units. Our data strongly question frequently described GPCR pharmacophore hypotheses in the literature, which describe a specific interaction between an arene partial structure of the ligand and the aromatic amino acid side chains of the receptor as essential requirements. Employing CoMFA and CoMSIA, 3D-QSAR studies were performed to access affinity and selectivity predictions for dopamine receptor subtypes and to establish suitable pharmacophore models. Exploiting both solution phase and solid phase supported syntheses, we rationally developed small molecules displaying structure-activity relationships that revealed novel insights into the binding and activation process of the dopamine D4 receptor subtypes. 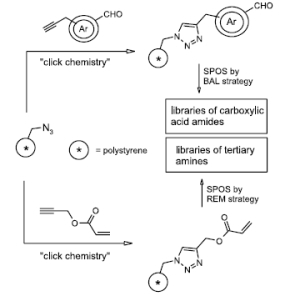 These studies were strongly facilitated by click-chemistry-based functionalized resins. Recently, we described enantiospecific syntheses and binding profiles of D3 receptor agonists when an active state model for the D3 subtype could be established via a combination of a ligand- and a structure-based approach. Homo- and heterodimerizations (or oligomerizations) of GPCRs are essential for their function, biosynthesis and internalization. 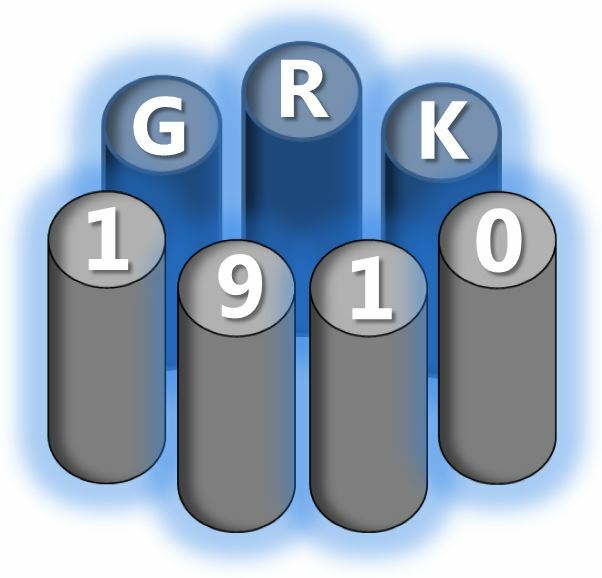 Based on in-house structure-activity data, the Gmeiner group tries to better understand homo- and heterodimerization of GPCRs. To exploit dimer related phenomena for a better treatment of GPCR mediated diseases, dimer specific receptor ligands are of superior importance. Thus, we currently synthesize bivalent GPCR agonists and antagonists and investigate their binding and activation properties in comparison to the respective monomer analogs. For the construction of flexible linker systems we take advantage of click-chemistry. Our research efforts are particularly directed to homo- and heterodimer specific dopamine receptor ligands that could be of special interest for the understanding and the treatment of neurological and psychiatric diseases. In collaboration with the laboratory of Prof. T. Kuwert and Prof. O. Prante, Nuklearmedizin, FAU, we try to take advantage of our structure-activity analysis to establish highly selective imaging agents as in-vivo marker for NTS1, NTS2, D2, D3 and D4 receptor subtypes. PET and SPECT investigations have been successfully performed. To increase subtype selectivity and to address an entropically based loss of affinity, the Gmeiner group is concerned with the synthesis of conformationally restricted peptide mimetics and uses this structural moieties as molecular scaffolds for neuropeptide analogs. Taking advantage of ruthenium promoted ring closure metathesis reactions, discovered by R. Grubbs, we generated a synthetic approach to a novel series of dehydro-Freidinger lactams. As molecular templates, 6-, 7-, 8-, 9- and 10-membered cyclic peptide mimetics could be used. We could demonstrate by a series of NMR-experiments including NOE-difference, NOESY, temperature coefficients, and anisotropic effects that the conformational behavior of peptide mimetics is efficiently controlled by the size of the dehydro-Freidinger lactams and the position of the double bond. Applications to neurotensin analogous neuropeptide mimetics gave strong evidence for the elucidation of the bioactive conformation of the natural. The Gmeiner laboratory is currently continuing these efforts in order to develop a first non-peptidic neurotensin receptor agonist, which could be of extraordinary importance for an improved treatment of schizophrenia. To significantly increase the efficiency of the drug design process, the Gmeiner group has established the use of click-chemistry for a novel linker strategy that can be employed for solid phase supported synthesis of bioactive compound libraries. Thus, orthogonally functionalized resins revealed to be efficient synthetic tools. Currently, this concept is extended by click-chemistry-based immobilized reagents and scavanger resins.